Researchers will discuss their progress in Niemann-Pick Type C (NPC) research throughout the three-day conference, which will be broken into six presentation sessions and one poster session. This year’s event has attracted international participants from Chile, Denmark, France, Israel and the United Kingdom, as well as researchers from Columbia University, National Institutes of Health, Scripps Research Institute, Stanford University, Tufts University, Weill Cornell Medical College and many other universities and institutions around the United States. Niemann-Pick Type C disease is a rare, fatal neurodegenerative disease for which there is currently no cure. NPC primarily strikes children before and during adolescence and affects one in every 150,000 children. The disease causes cholesterol and other lipids to build up in the body’s cells, which results in symptoms such as delayed motor development, deterioration of memory and balance, and seizures. 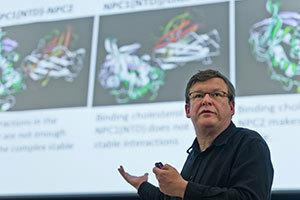 There is no cure for NPC, but research has led to a better understanding of the disease and some promising treatments. Two Notre Dame researchers and their collaborators have identified histone deacetylase (HDAC) inhibitors as potential therapeutic agents for NPC and have gained approval for clinical trials later this year. Several of this year’s presentations will discuss different aspects of this finding, including the testing of HDAC inhibitors on NPC cell lines and the proof of concept used to get approval for clinical trials. Other presentations will also discuss discoveries of new biomarkers for the disease, new findings in disease progression, and other potential treatments that are currently being studied. Cindy Parseghian, who lost three children to the devastating disease and founded APMRF with her family, will give remarks at the beginning of the conference. Parseghian and Nadine Hill, executive director of the National Niemann-Pick Disease Foundation, will give a special presentation at the reception on Thursday evening. The conference is open to the media, but closed to the public. It is made possible through a generous gift to Notre Dame by APMRF, which established the Michael, Marcia and Christa Parseghian Endowment for Excellence to support NPC research and discovery. Originally published by Stephanie Healey at news.nd.edu on June 11, 2014.